Through time the ages of civilization have typically been named after the materials we have used. Today we are in the age of designed materials. This paper is tuning in on the fascinating world of intelligent materials and nano scaled materials. The word design is mainly associated with the design of objects – that is, external objects that relate to the human scale. In the world of materials, design is something internal. 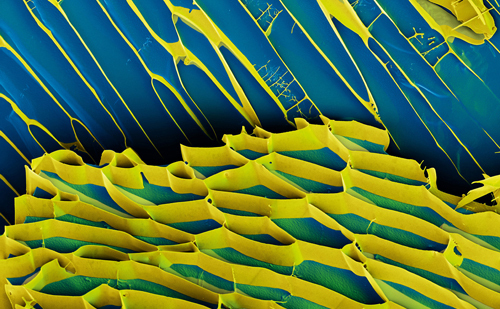 The development of production methods on the micro scale has led to far greater control of how we design and construct new materials – a kind of design mainly invisible to the eye. Through time the ages of civilization have typically been named after the materials we have used: stone, bronze, iron. Today the silicon of the computer might be a candi­date for such a nominator, but the world is no longer dominated by just one material; there are many different, and the combinations they permit are particularly interesting. New materials are very much a matter of new scientific knowledge. The volume of research in the world of biology, physics and chemistry doubles every ten months – a rate of development that remarkably parallels that of the development of computing power. The materials of the future are already a reality. They exist in many of the pro­ducts we use in our everyday life, and they can help us to find answers to many of the challenges we face in the development of sustainable design. The question is not which material you want to choose, but which properties are desi­rable for the specific job. Ultimately, the periodic table of elements defines our building-blocks. The following two sections describe two of the most fascinating material groups: the intelligent materials and the materials of nanotechnology. The intelligent materials are also called responsive materials, because they react to external stimuli such as changes in temperature, pressure, movement, electricity, radia­tion and the action of chemicals. This means they can change form, structure, colour or generate energy in accordance with the conditions around them, which opens up a brand new understanding of materials where they can interact directly with the architecture and the users. Intelligent materials already exist to a great extent in our everyday life. Many products contain monitoring or responsive functions – for examples windows that tone down harsh sunlight, surfaces that change colour at different temperatures, or windows that are temperature-sensitive and open and close automatically. At the overall level there are two categories of intelligent materials: property-changing materials and energy-exchanging materials. Let us look a little closer at the two groups. Chromatic materials, which are a group of smart materials that inevitably fascinate any designer because of their ability to change their optical properties and thus change colour. They are used to indicate changes in light, heat, pressure, aci­dity and electricity. For example a thermochromatic coffee cup changes colour when it is filled with hot coffee, and an electrochromatic window can be dimmed by running a current through it. Phase-changing materials, which are able to store and release large quan­tities of energy. They change between solid and liquid form with shifts in pressure or temperature. These processes are reversible, which means that phase-changing materials can undergo infinitely many phase shifts without degenerating. There are for example microcapsules with phase-changing materials that can be calibrated to store and release energy at room temperature. Electroactive materials are either polymers or metallic materials that are woven into textiles, making them electrically conductive. With the increasing use of electronic equipment in our time, current-carrying materials are particularly interes­ting. Intelligent materials that transform energy from one state to another to start a pro­cess or change form are called energy-exchanging materials. They function with the aid of an external control. Luminescent materials light up when they absorb energy – a phenomenon known for example from natural phosphorescence. Many properties, including the colour of light, can be adjusted for the desired purpose. The use of photo­lumi­nescent or electroluminescent materials can make things luminous. We know this from among other things diving lights and organic LED light, which is said to be the light source of the future. Piezoelectric crystals react by creating an electrical current when they are affec­ted by mechanical forces. This effect is reversible. If an electric current is applied to such crystals they change form. Piezoelectric materials are therefore used as sensors and actuators. In the architectural perspective kinetic energy from wind and humans can be converted into light, mechanical cooling or other energy-requiring functions. Materials with ‘shape memory’ are either metals or polymers. It is charac­te­ristic of both groups that they return to their original form or geometry after a defor­ma­tion. For example a suture has been developed for surgical operations that ties a knot in itself. If the thread is tied around a blood vessel and actuated by body heat it goes back to its original form. Nanotechnology is an interdisciplinary science – a meeting-ground from which new knowledge of the molecular world arises. A mixture of medical and material research spiced with mechanical and electrical engineering. It is in the area between these different sciences that nanotechnology plays its role. Since there is no fixed formula for what defines a nanomaterial, it can be difficult to speak of a special category of materials. Nanotechnology is characterized by the use of very small components which by their nature or through manipulation can create new properties which can be added to and improve existing materials. In reality these are materials with no real materiality. First and foremost it is the scale that is fascinating, and this is also used to name the technology, because it is so inconceivably small; a nanometre is a billionth of a metre, a unit one hundred thousandth of the thickness of an average human hair. The aim of working on the nano scale is that the properties of the materials function quiet differently at the nano level than at the macro level. The world as we know it functions on the macro scale, where cause and effect are predictable and conform strictly to the prevailing physical and chemical laws. On the nano scale things work differently. The sizes of the particles are a critical factor. Quite different conditions apply when the effects of the force of gravity are neutralized, and electro­static and quantum-mechanical factors take over. This is where the strength of nano­technology lies. If one can manipulate structures on the nano scale, one can influ­ence the properties on the macro scale, and thus produce brand new materials and processes. Nanotechnology is in the borderland between atoms and molecules, a world where the functional properties of the materials are dictated by the compo­sition of atoms. Nanotechnology is expected to influence almost all industries – including the con­struction industry. For many years to come the developments will be visible because of the improved properties of traditional materials like concrete, glass, com­posites, insulating materials and even wood. Materials will become stronger, lighter, more durable and cheaper. In other words the development of new materials has a very promising future – and this is not just speculative futurology, for there are already many materials that take advantage of nanotechnology. ‘Thin film’ could also be called functional film, since it is a transparent coating with specific properties. Thin film is used everywhere, all the way from ultraviolet filters that protect us from the rays of the sun to teflon surfaces that make the facades of buildings easy to maintain. The self-cleaning action of the lotus leaf is a good example of the way mod­ern technology can imitate the properties of nature. using nanotechnology one can recreate the leaf’s water-repellent property. On the face of it you might think that a water-repellent surface should be as smooth as possible, but on closer scrutiny you discover that the structures on a lotus leaf are uneven. Today imitating this structure has led to the production of self-cleaning glass. Experiments are also being done with other alternatives to conventional glass; for example a cellulose-structured thin film is being developed that is completely transparent and biodegradable. A material that is also much sought-after in the nano world is silver. It keeps its form, it has the same colour in all kinds of weather and on the whole it is a chemi­cally very stable material. But in very small quantities it behaves quite differently. Nano-sized silver particles are extremely reactive and have long been used to clean materials and sterilize surfaces. The same is true of titanium dioxide, used as what is called a photocatalyst. This is a relatively new material in Europe, but is widely used in Japan. It is activated by the ultraviolet rays of the sun and creates self-cleaning and air-purifying surfaces. Photocatalytic surfaces are used to maintain facades, roofing panels, bridges and roads. Because of their self-cleaning properties they are also used to keep hospitals bacteria-free and to purify the air in offices and restaurants. The use of such surfaces improves the air quality by something between twenty and seventy per cent. In other words it is a material which, used on facades in cities, could solve problems caused by smog and other pollution. 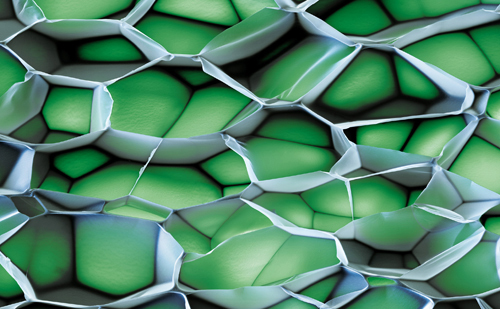 Nanotechnology can also be used to make solid materials. One example is electro­spinning, where you weave textiles by means of an electromagnetic field. In electro­spun textiles the fibres are only a few atoms thick – in other words the diameter is less than the wavelength of visible light, which makes the fibres invisible to the human eye. They are used in many contexts, from biochemically active materials to soundproofing and air filters. The ‘hottest’ nanomaterial today is carbon nanotubes. The special feature of the material is that it is based on the smallest building block in nature – the atom. It has become possible to control the way atoms arrange themselves so they form tubes of carbon atoms with a diameter of one nanometre. This is a good example of how far ‘bottom-up’ processes have come. Today nanotubes are used as additives to strengthen composites and other structural materials. 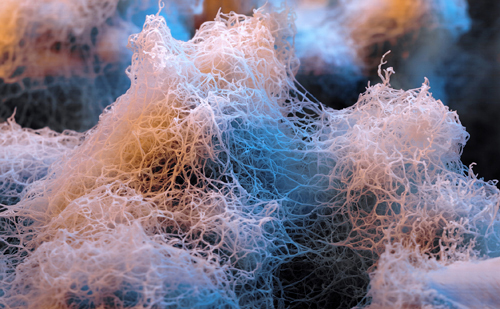 In the near future nanotubes can be used to produce the phantom material ‘buckypaper’. This is a material where long nanotubes are used to weave textiles that are then stacked or laminated as a composite. It looks like ordinary paper, and is ten times lighter than steel, but up to five hundred times as strong. It has been pre­dicted that this will transform the way we build everything – from highrises to air­craft. For several decades the construction sector has been described as an area where nanotechnology will bring about huge changes. Nevertheless nanomaterials are used to a very limited extent in buildings today. This is due to their high cost and the lack of experience from reference projects. On the other hand there is nothing that can stimulate development better than a clearly defined task, for example a Moon mission or a Formula One race. The task that is more evident than any other today is that we have to solve the environmental problems facing the world – and the biggest ones are created in the building sector. Technology is only a means to an end; the true challenge is to exploit the potential of re-inventing our use of materials. Kasper is an innovator and developer at 3XN – one of Europe’s most successful architectural firms. He is a spokesperson for the integration of new materials and technologies in architecture. This entry was posted in Material Innovation and tagged Biochemically active materials, Energy-exchanging materials, Functional surfaces, Intelligent materials, Nano materials, Nanostructured solids, Property-changing materials. Bookmark the permalink. generic form of allopurinol buy ultram online fedex difference between prescription omeprazole and over the counter omeprazole finasteride costo colombia buy tizanidine 4mg buy doxycycline vietnam hydrocodone for sale in dallas skelaxin for sale cost of carbamazepine 200mg betamethasone cream brands lexapro pharmaceutical assistance TheTreasury actually signed that agreement. I sure do like Snow White with her chucking and catching power. Published in 1990, it contains three picture book stories, four short stories, four historical stories, two poems, one historical treaty, one piece of artwork by Maurice Sendak, and one song called “One More Time. The school is considered to be the topmost of schools for snooty (ahem, wealthy young women). Thank You very much. Two aspects of the QM rule, though, may make this market slow to develop for borrowers with lower credit scores. Ideal for academic and clinical occupational therapists, this book will also appeal to psychotherapists. Part academic biography, part theoretical explication and part history lesson, this book reinforces the centrality of the spoken word and lays open the intricate, multi-faceted career of a remarkable teacher, scholar, and disciplinary leader. I was not compensated for this review.